Connecting us all to New York's extraordinary experiences, people, and places. In January 2017, Governor Cuomo announced the Empire State Trail, a new initiative placing New York State at the forefront of national efforts to enhance outdoor recreation, community vitality, and tourism development. Approximately 400 miles of the Trail already exists in discrete, disconnected segments. When completed by the end of 2020, the Empire State Trail will be a continuous 750-mile route spanning the state from New York City to Canada and Buffalo to Albany, creating the longest multi-use state trail in the nation. The Empire State Trail promotes healthy lifestyles and provides a place for friends and families to experience everything the Empire State has to offer. The Empire State Trail will be a multi-use path designed to accomodate shared use by pedestrians and bicyclists. Read the draft plan and the proposed design guide for the Empire State Trail. Finalizing more than 60 construction project descriptions, scopes, budgets, and timelines. Installation of wayfinding and information signage along existing trails; new trail construction to begin. Completion of the 750-mile Empire State Trail, making New York home to the longest state multi-use trail in the nation. The proposed route of the Empire State Trail within the Hudson Valley, including exisiting and proposed new trails. The proposed route of the Empire State Trail within the Erie Canalway corridor, including exisiting and proposed new trails. 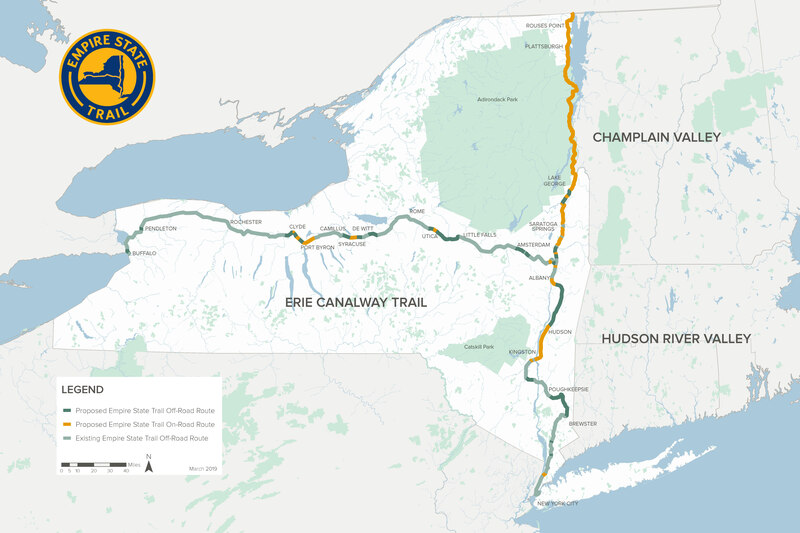 The proposed route of the Empire State Trail within the Champlain Valley, including exisiting and proposed new trails.